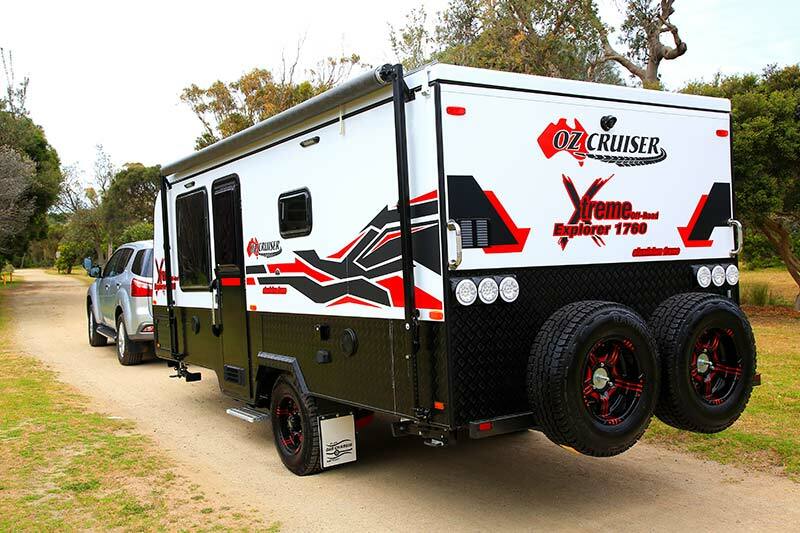 The Oz Cruiser Xtreme Off-Road Explorer 1760 is an intriguing pop-top that should appeal to adventurous couples. Large vans replete with all the gear are appealing, but I usually prefer compact rigs. I’m not opposed to being comfortable, so if that compact van has a bathroom, an internal kitchen and a large fridge, all the better. Recently, a new van came into my life, the Oz Cruiser Xtreme Off-Road Explorer 1760. At first glance, it seemed tailor-made to my tastes: not so large that manoeuvrability on tight tracks is difficult, and equipped with just the right amount of features – it doesn’t go overboard in the comforts department, but nor does it skimp. We hitched it up at the dealership Peninsula RV Centre in Seaford, Vic, and headed to Rosebud to take a closer look. As its name suggests, our review van is designed for offroad travels. It’s not the lightest pop-top on the road, but at 2260kg Tare the Explorer 1760 is not unduly heavy. On its 16in alloy wheels and Control Rider independent coil suspension, it sits quite high and, in hindsight, I should’ve flipped my vehicle’s towbar tongue around to better level the ride. Nonetheless, despite the slight nose-down attitude, the pop-top displayed no unusual behaviour under tow – I felt confident cruising along Victoria’s Mornington Peninsula Freeway at 100km/h. It is built on a 6in G&S DuraGal chassis with a 6in A-frame. Its two 90L water tanks are mounted forward of the axle. The underside of the van is quite neat and tidy; however, there wasn’t any armour plating for some of the vulnerable components, such as the PVC pluming. However, I’m told that this would be fitted to future vans before being delivered to customers. The Explorer 1760 has a decent storage system mounted to the A-frame. Made of black checkerplate, it also incorporates a couple of jerry can holders and an offside slide-out tray to house a small portable generator. Given the location of the dual water tanks, it’d pay to keep an eye on the ball weight when loading heavy items to the front if those tanks are also full. But having said that, the pop-top does have a maximum permissible ball weight of 350kg – much depends on the capabilities of the tow vehicle. Just behind the drawbar is a full-width tunnel boot, with a nearby gas bayonet mounted to the chassis on the nearside. No barbecue is fitted as standard but no doubt one could be optioned in, or why not bring along your own Weber Q? The rear of the van sports a reversing camera and dual spare wheels fitted to the four-stay bumper bar, while a full-length Aussie Traveller roll-out awning is fitted to the nearside, along with a 12V point for charging phones and tablets, etc. It also had a couple of external speakers and two awning lights. With its high waist of protective black checkerplate and composite aluminium cladding (over an aluminium frame), the Explorer 1760 certainly looks the part. The roof pops up in the usual way – simply undo four over-centre external catches. Due to the high-riding stance of this van, a step or small folding ladder might come in useful here. It’s then just a matter of lifting the roof from the inside. Because Oz Cruiser has opted to fit an under-bed air-conditioner, rather than a roof-mounted unit, the roof is quite easy to lift. There’s very little to not like about the inside of this van. In fact, it somehow feels larger than it actually is. In the nose of the van is the queen-size bed with wardrobes either side; however, due to the tunnel boot and the aforementioned air-con, storage space beneath the bed is limited. The kitchen, meanwhile, is quite well set-up. 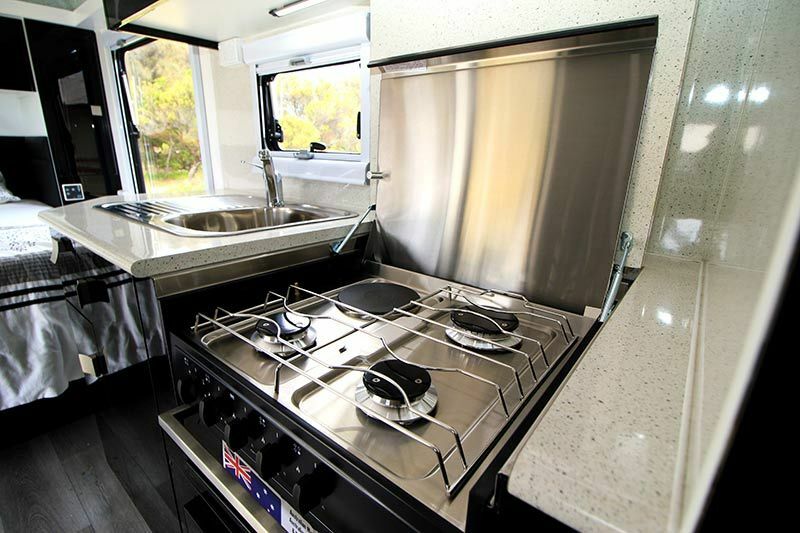 It has a four-burner cooktop with a microwave below in lieu of an oven, a sink with flick-mixer tap, some overhead lockers and cupboards beneath the bench, not to mention a swivel arm for the supplied 24in flatscreen TV. Bench space is, admittedly, limited to the hinged bench section above the cooktop and the adjacent dinette table. The dinette, by the way, should easily seat two or three people for meals. It also comes with a few lockers above, multi-directional reading lights, and a 240V and 12V powerpoint. It’s not a huge issue but I did wonder if those powerpoints would be better located in the leg space of the dinette, rather than just below the overhead lockers. That way, power leads would be less in the way. The fridge-freezer in this van is quite generous – this 190L three-way unit is mounted between the kitchen and full-width rear bathroom. Given this pop-top’s compact dimensions, the bathroom is generously appointed. It comes with an offside cassette toilet, a central vanity, and a moulded-fibreglass shower. The biggest surprise, though, was the inclusion of a top-loader washing machine. A small negative is that instead of a solid sliding bathroom door, Oz Cruiser has oped for a basic curtain. In an otherwise stylish van, the curtain seems a little out of place. In terms of 12V power, the Explorer 1760 is equipped with two 105Ah deep-cycle batteries and two 150W roof-mounted solar panels. The regulator, along with the 12V fuses, hot water service and water pump switches, and the Projecta battery charger, are sensibly centralised in a locker above the dinette. All in all, the interior is nicely presented and very liveable for two people. Other than the limited amount of kitchen bench space, there doesn’t appear to be too many compromises. It is attractive and functional. With a decent 12V setup, a reasonable Tare, a great load-carrying capacity, and an interior that’s somehow more spacious than the pop-top’s overall dimensions suggest, the Explorer 1760 deserves a good, long look. The plumbing underneath lacked a stone guard, but I’m told this would be fitted before the van was delivered to customers.